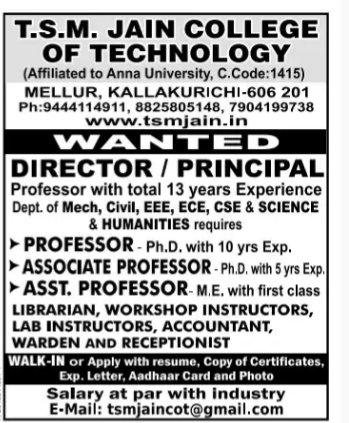 T.S.M Jain College of Technology, Kallakurichi,has advertised in THE DINAMALAR newspaper for recruitment of Teaching,non teaching staffs jobs vacancies. Interested and eligible job aspirants are requested to walk-in immediately. Check out further more details below. About College: T.S.M Jain College of Technology, was established by an eminent educationist and philanthropist, Shri.T.Manohar Kumar Surana, our institution has opened up it realms towards imparting value based on technical education. This prestigious institution made its humble beginning on 4th September 2010 with approval of AICTE, NewDelhi and affiliated to Anna University Chennai. The sprawling campus is located on an elevated plot of 26.70 acres of land, economically utilized for education and located with in the limit of 7 km away from Kallakurichi bus stand on the Salem-Chennai highway road NH79. The college is housed amidst lush green lawns, in a serene environment, conducive for pursuit of education. TSMJCOT will grow to be a world renowned centre for excellence which is our aspiration and endeavour. 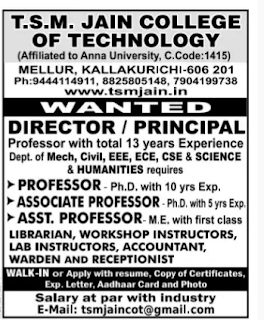 Principal/Director: Professor with 13 years experience. How to Apply: Interested candidates walk-in or apply with resume , copy of certificate, Exp letter, aadhar card and photo.